Forgive me, this will be a scattered, grocery list sort of post with too many links. Oh, well. I can scratch another resolution off of the list- well, almost. 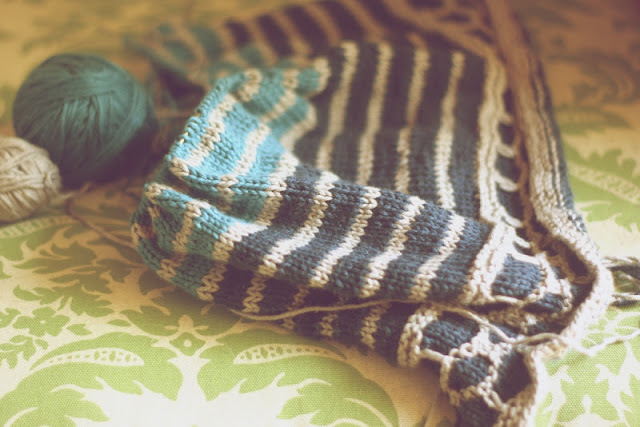 This summer, I've joined two knit alongs, my first ever. There's the Ravelympics, now sadly renamed Ravellenic Games (sigh) in which I'm pretty sure I'll try magic loop socks. Then there's the Summer Sweater Knit Along hosted by luvinthemommyhood. I probably would not have tried either and gone on knitting away in solitude, except that I made a resolution to try a knit along at some point this year and after reading about possible Ravelympic events, I found two really great skeins of hand painted sock yarn on vacation that would make the Sock Put a worthy challenge. So, I joined. Since then, the whole Ravelympics infringing on the Olympic trademark controversy has sealed the deal- I'm doing it, though I may not watch the games much. The commercial buildup of the Olympics has always been a turnoff for me and reading about the behind the scene excesses, pressures, and scandals never helped. But, good grief, Ravelympics was the only reason I planned to tune into the games this year. I was actually going to watch. Why must people take everything too far? Soapbox aside, I'm thinking of trying socks with the magic loop method, two at a time, and toe up. No doping here. That would have been enough to give me a taste of group knitting, but the thing is I've been seeing a couple of very active online knitting groups that make me want more togetherness. Look, I can do quiet isolation, really, but it's nice to have options. The only time I seem to be working on a common goal with other people these days is at church. This is a worthy, huge goal, but along with the importance of the message, there is the good feeling of accomplishing something in the presence of friends. So, when I saw that one of luvinthemommyhood's suggested sweaters for the Summer Sweater Knit Along was the Campus Jacket that I had just queued and bought the yarn for, well, it sounded like fate to me. 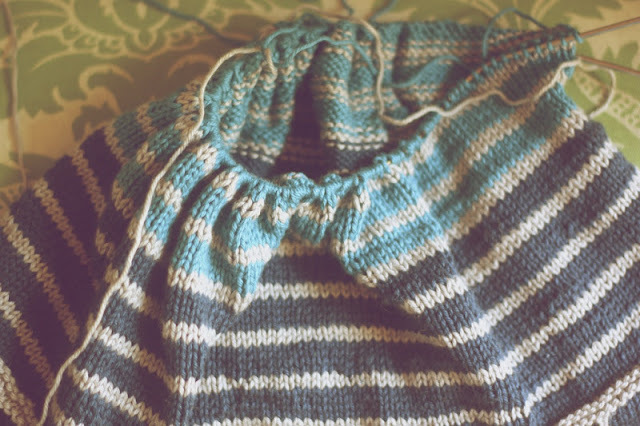 So today is Day One of the Summer Sweater Knit Along and I just signed up. I have a half finished Holla Knits top on my lap and the yarn for two more burning a hole in my closet. I have the thick and thin to try this one again and the yarn ready and waiting for my Knit Along jacket, only I know I'll have to interrupt that for the Sock Put event. I won't even go into the other three projects I have waiting and ready. I just need to finish up Vacation Bible School tonight and my mind will be free for all kinds of crafty plans.